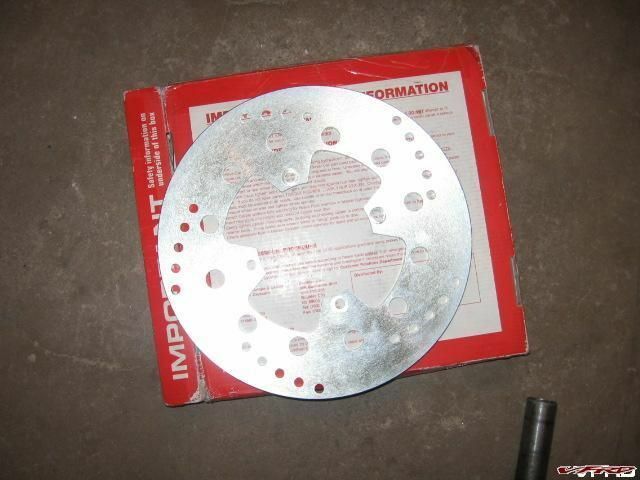 I have been noticing a pulsation in my rear brake petal at high speed, I suspected a warped disk and so I inspected it last time I was changing my rear tire and it was warped out of spec (0.012in) runout it was way over that at .03in. I notice the pad was dragging and that must have overheated the disc to warp like that. Thanks to Rob M moderator here I was able to bid on a new one cheap on ebay from a seller here in Colorado. The EBC billet stainless unit I bought was a smidgen lighter and supposedly has more bite with brake pads, haven't tested that yet (too damn cold to ride today). 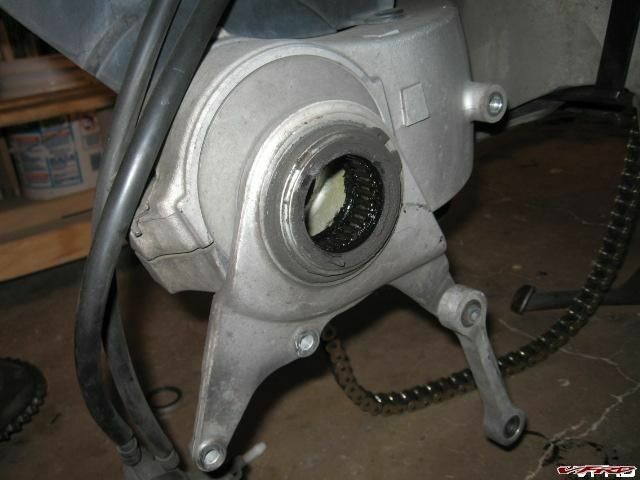 You can take off the disc bolts without having to remove the axle but it is tight and if the bolts are frozen like mine were it may be impossible, in any case you must remove the caliper to free the disc. 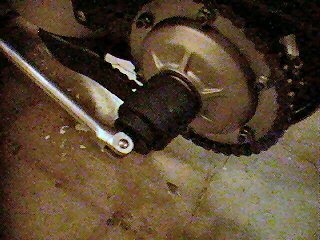 I tried to with a 12mm boxed end wrench on one side (side facing the swing arm) and a 12mm socket on the other. It loosened one but the others were stuck, and there is very little room to work. I had to remove the axle. I had a rock stuck in the pad and it bore a groove on the inside of the disc too, it was tiny but just enough to grind away at the rotor. Craigs big socket - I did not have access to this time. I decided to remove the big nut on the hub, its huge like 35mm or something like that, my Friend Craig actually bought a socket for it but he wasn't around so I ended up using a big old pipe wrench, the nut was already a bit chewed up so I just went at it. It came right off. I loosened the bolts on the chain stays to allow room to remove the chain and the cush drive. 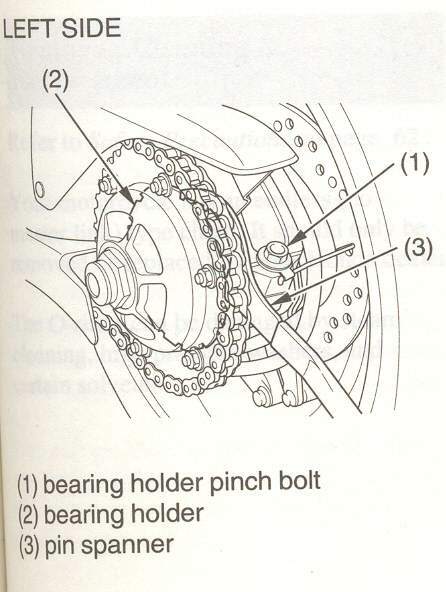 (loosening the eccentric hub bearing holder pinch bolt and using the chain tool to loosen the chain). sometimes its easier to remove the chain stay but I just took off the aft bolts to let is flop around so I could remove stuff. Pop off the cush drive it just slides off the splines. Cush Drive This just slides off the splines of the axle, as long as the chain stay is not in the way, and the chain is removed. 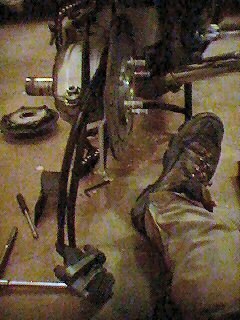 Removing the rear caliper is easier with the cush drive off so you can fit a socket on to the bolts, otherwise a boxed end wrench will work, the cush drive gets in the way, remove the two bolts off the swing arm caliper hanger. 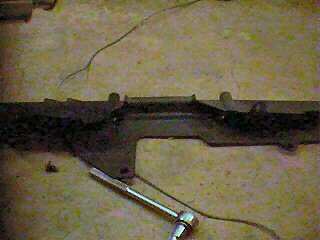 I also removed the hex bolt out of the dog leg to let it swing down to were I could get at it better. Ecentric hub needle bearings inspect and lube bearings. 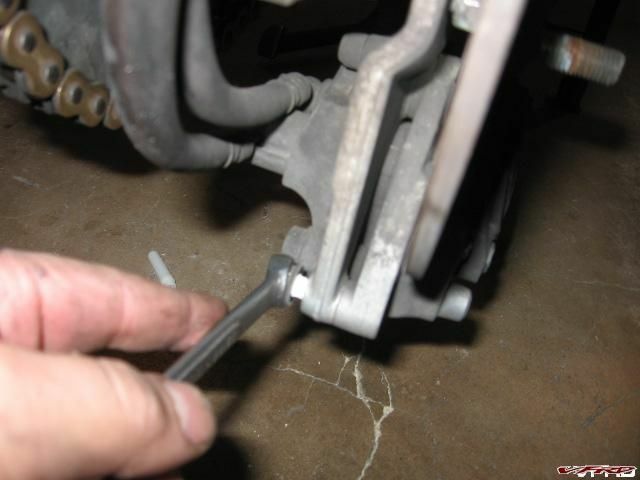 At this point after the caliper is removed you can just pull the axle out of the eccentric. I noticed one of the pads was not seated properly?? OK that was the trouble eh and the caliper did not float properly sliding on the two pins, it is supposed to be able to slide side to side and float with the movement of the rotor. I worked it back and forth and would then slide freely. It has rubber boots over the pins one was ripped, I need to order new boots, I just slabbed some grease on it for now. 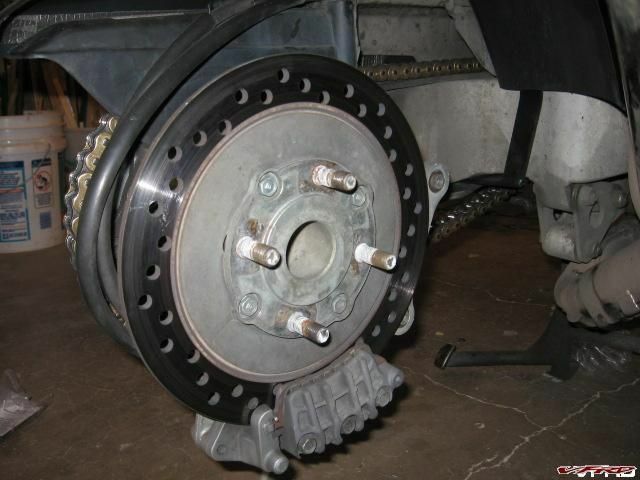 I put in new pads while I had the caliper off. 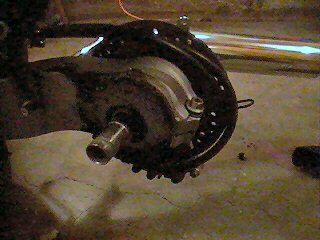 I used Honda grease on the bearings and the caliper pin that had the torn boot. 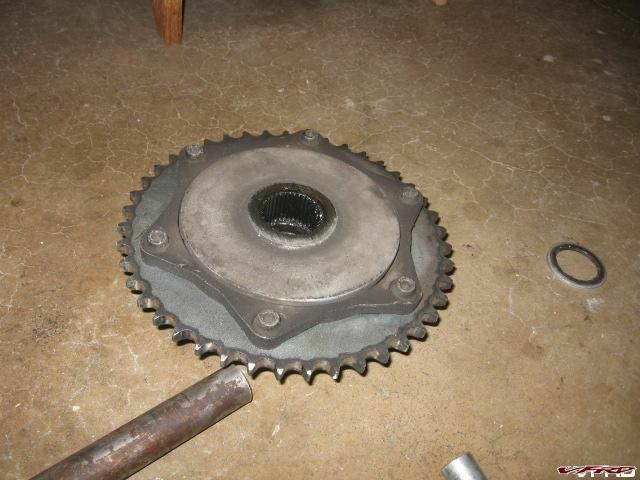 I put on the new rotor and reinstalled the whole thing. 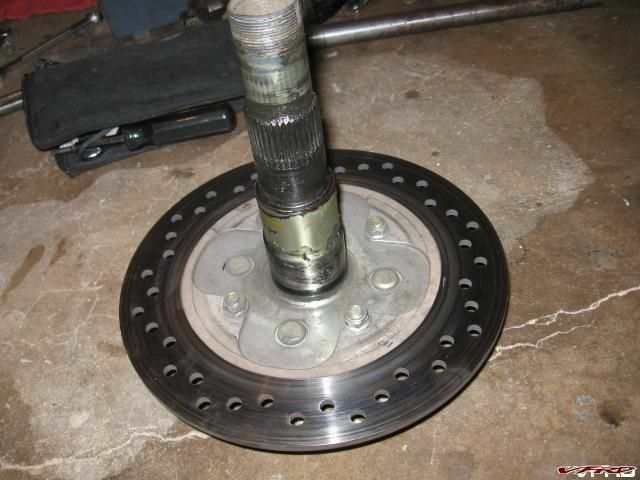 There is a spacer place between the rotor and the carrier don't lose it, and make sure to follow the arrow on the rotor so that it rotates in the correct direction. after pushing it back into my bike shed it rolled much easier!! Job done! Thread from the dead, but thanks to Google, I found this. 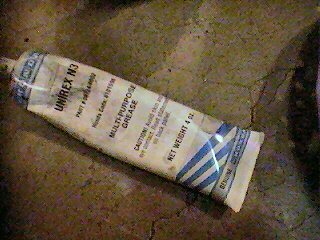 I'm glad it survived the troubles because it's going to save me a bunch! Yeah, that's the one my bike chewed up. Part of it got eaten up when the PO didn't lube the slide pins, the other part when the center piston wasn't moving freely and it ate through the pads and ground the rest of it up. Tha's my fault.